Tofu scrambles are incredibly easy to make, and when seasoned correctly they taste very similar to scrambled eggs! I made this one using leftovers from my pasta dish the other night, but the variations are pretty much endless. 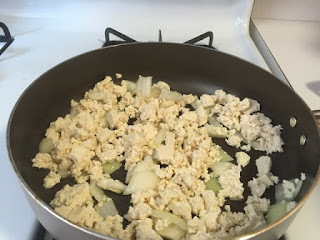 Heat up oil in pan on medium heat, add tofu and onions and cook until tofu starts to brown. 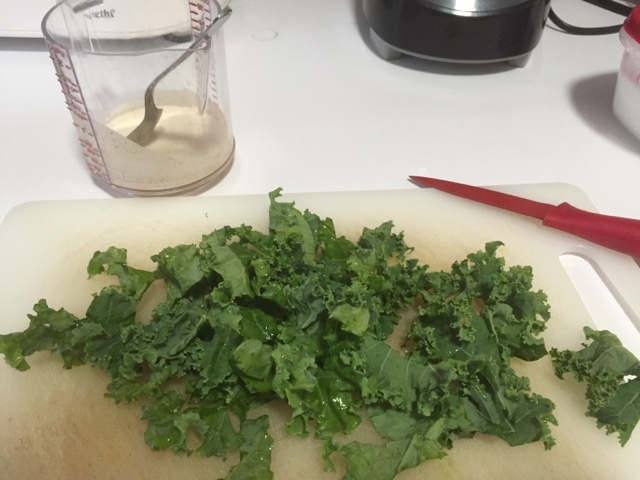 Chop kale into small pieces. Mix coconut milk with seasonings (a couple shakes of each). 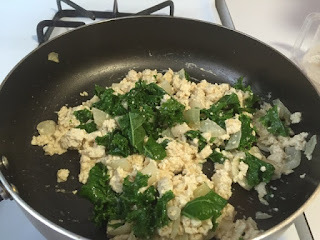 Add kale and "milk" mixture to pan and stir everything together. Add more seasonings as necessary. Cook a few more minutes. 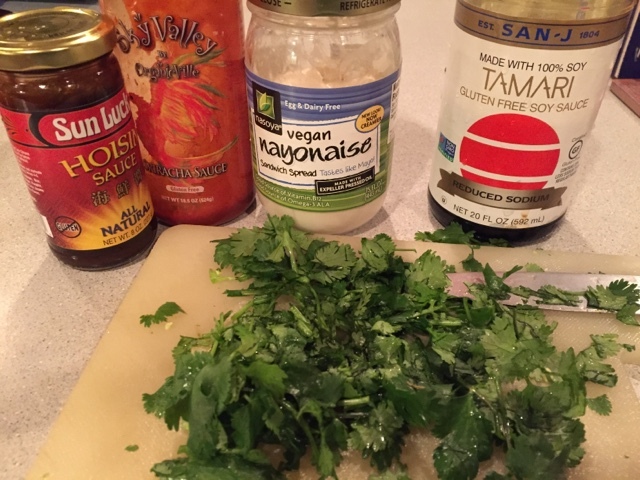 Top with salsa and serve! Tip: Tofu on its own has a very neutral flavor, so don't be afraid to go heavy on the seasonings. It always helps to add a little at a time and taste as you go! 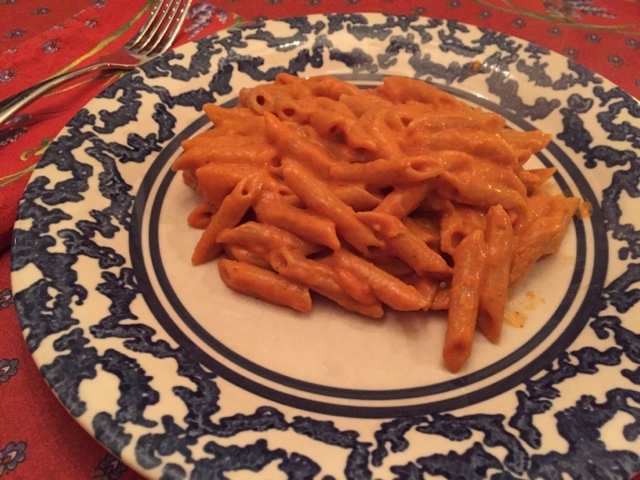 This recipe uses coconut milk to make a nice creamy sauce! 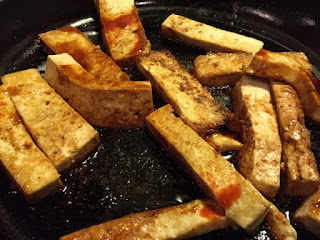 Heat up oil on medium high heat, add tofu, and cook for a few minutes. Reduce heat to medium low, add tomatoes, onions, sugar, salt, garlic powder, pepper, and seasoning; adjust seasonings to taste. 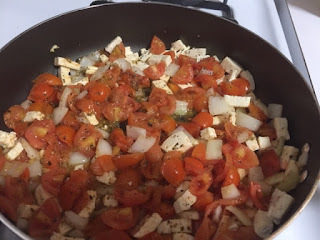 Cover pan and let simmer for a bit until tomatoes start to come apart. Stir occasionally and add more oil if it becomes too dry. 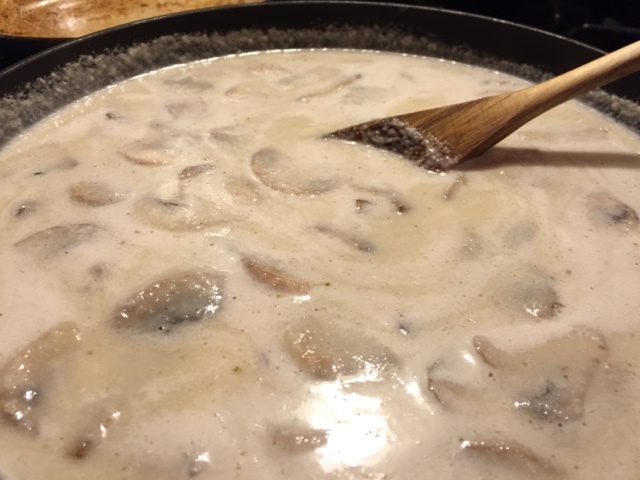 Add enough coconut milk to make the sauce nice and creamy. Add kale and cook covered for a few minutes, then stir everything together. 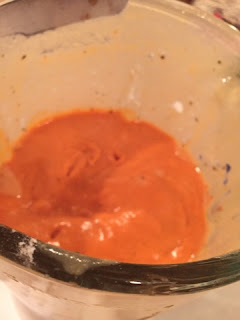 Pour the sauce onto the cooked pasta and mix. Enjoy! The name of this recipe in the book is Pasta Alla Norma with Ricotta. I am including the entire recipe, but you could use your favorite recipe for the pasta and eggplant. The headliner here is the pesto. Chloe calls it Rockin' Ricotta, but this is actually an amazing version of pesto that stands on its own. In fact, it is so good you could omit the tomato and eggplant and just serve the pesto on your favorite pasta. Everyone loved this recipe, and I will be making this often - probably by memory the next time. Sprinkle salt on eggplant, let sweat for about 1/2 hour, and blot dry. Cut into cubes. Heat olive oil, and sauté eggplant and garlic. 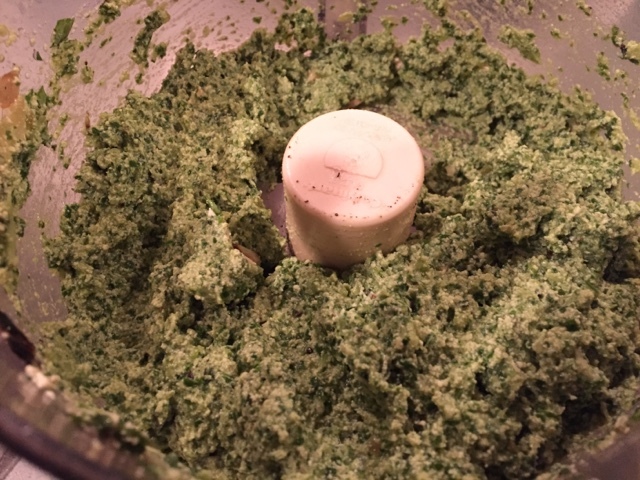 For pesto: In a separate skillet, heat olive oil and sauté onions until softened. For pesto: Rinse basil and pull off thick stems. In a food processor, combine basil, onions, tofu, lemon juice, garlic. Add salt and pepper to taste. 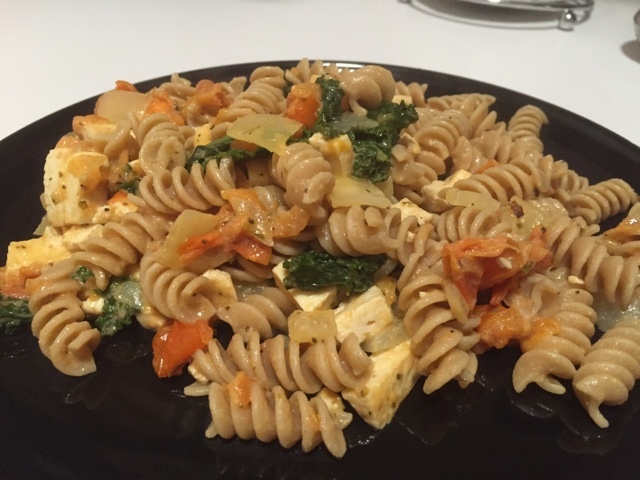 This is as tasty as "regular" pesto!! 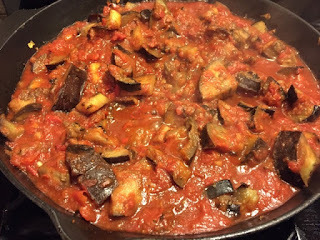 Add can of tomatoes to eggplant and season. Cook a box of rigatoni or your favorite pasta. 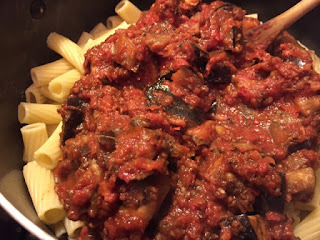 Combine pasta with tomato and eggplant mixture. 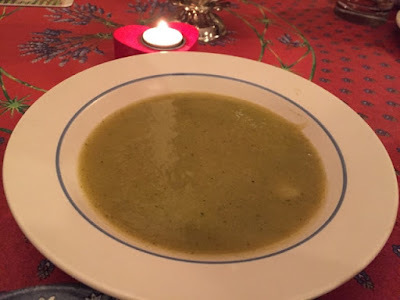 Top with pesto and enjoy! 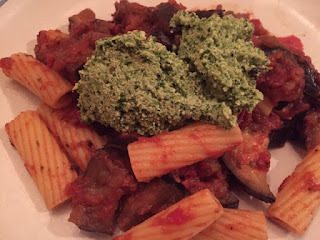 Tip: I saved the eggplant pasta mixture and the pesto separately, and the leftovers were just as good. We made this a few weeks ago with a fussy marinade that we didn't really notice, so I decided to try this as quick lunch without the marinade. It was very good! 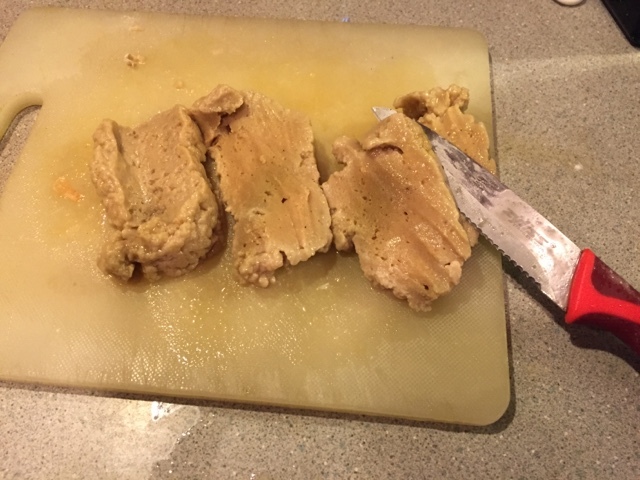 Combine crust ingredients and coat both sides of seitan. It will absorb easily. 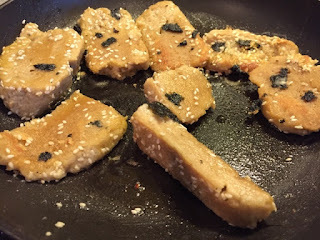 Heat oil until hot, and fry cutlets until golden and somewhat crispy. 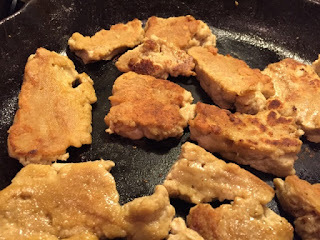 Blot cutlets on paper towel and serve at once. Enjoy! 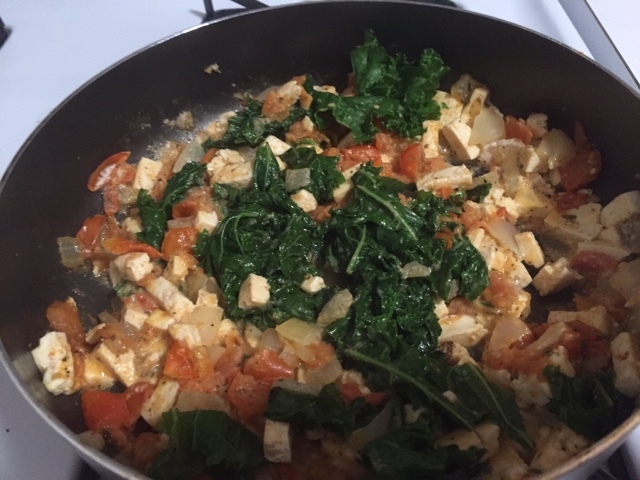 Tip: I froze leftovers for a quick weeknight dinner. 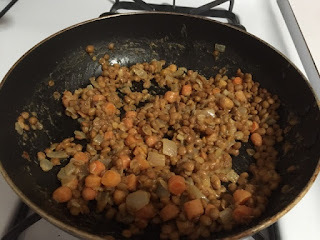 I love the combination of lentils and potatoes, so I made up this recipe with a couple of groceries I had at home. It turned out better than I expected so I thought I'd share. 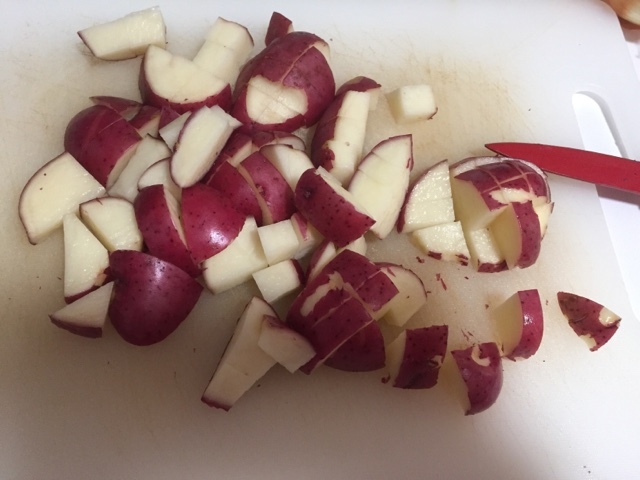 Chop up a few small potatoes, toss them in a pot of boiling water, and cook until soft. Meanwhile, cook chopped carrots, onions and garlic in pan with olive oil on medium heat. When carrots are tender and onions start to brown, add lentils, a spoonful of hummus, and Moroccan seasoning. Stir everything together and cook with a little bit (quarter cup or so) of water and some additional olive oil, until water has cooked off.. 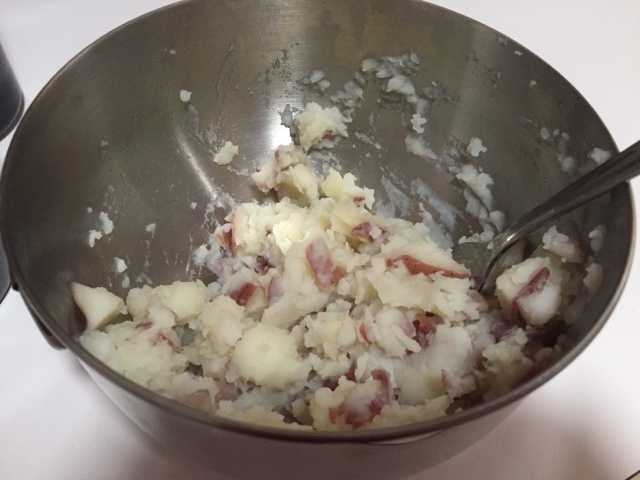 When potatoes are done: drain them and mash with a splash of water, some salt, pepper, and garlic powder. 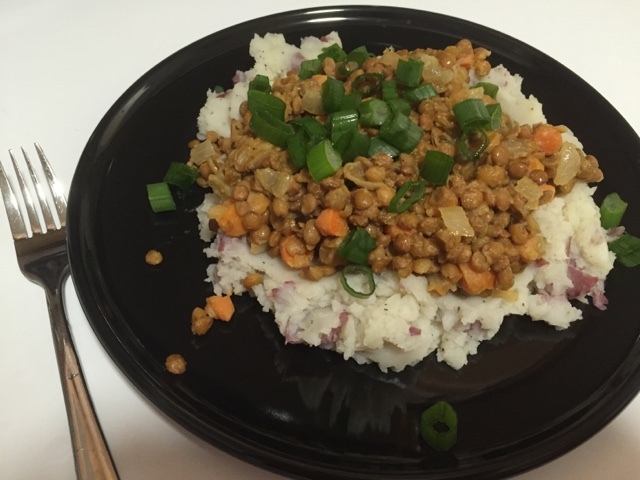 Spread the mashed potatoes on a plate, spoon lentils on top, and garnish with chopped scallions. 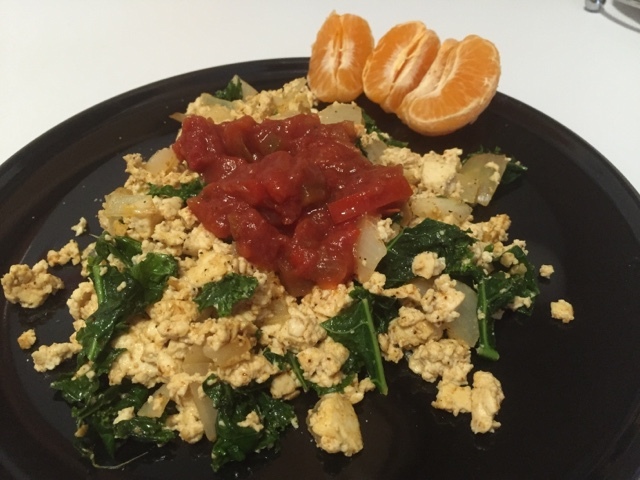 Note: This meal was easy because most of the ingredients are "staples" in my kitchen. Root vegetables like potatoes, carrots, onion, and garlic don't go bad very quickly, so it's good to stock up on them and keep them on hand. 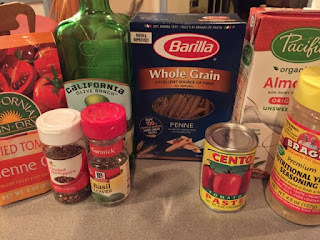 I also almost always have cans of black beans, lentils, and chickpeas in my cupboard for making quick, easy dinners. I love this recipe! 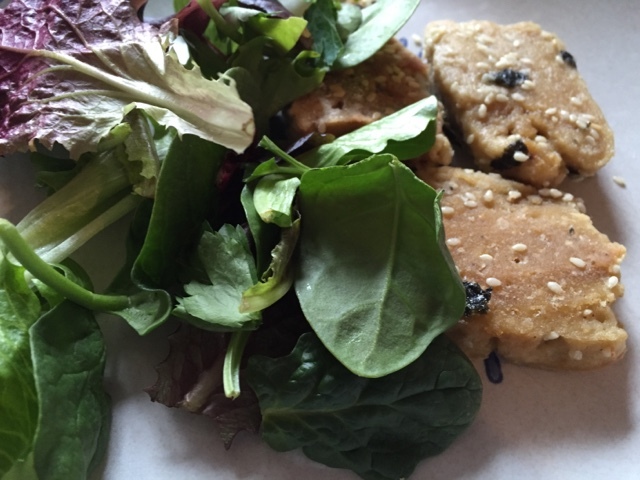 This is the kind of dish that gives vegan cooking a good name. The mozzarella sauce is amazing. 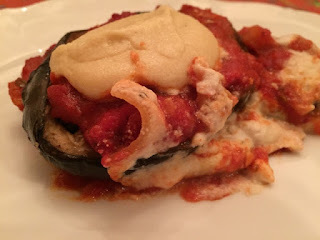 This variation of traditional eggplant parmesan stands on its own without having to buy the processed vegan cheeses which I generally try to avoid. This will definitely become a staple! 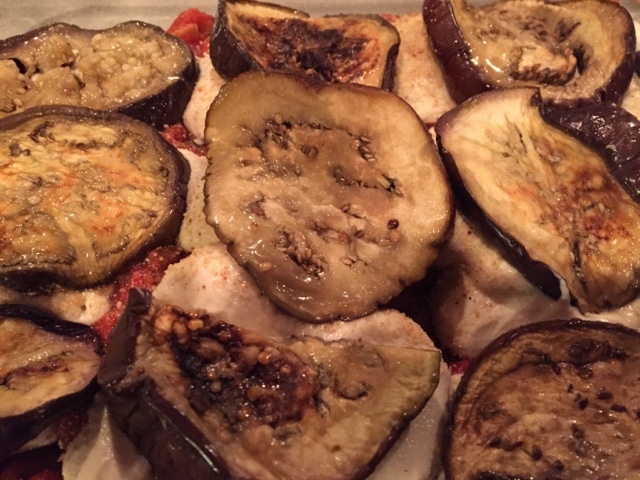 Salt eggplant, and leave in colander for 30 minutes. Blot dry. 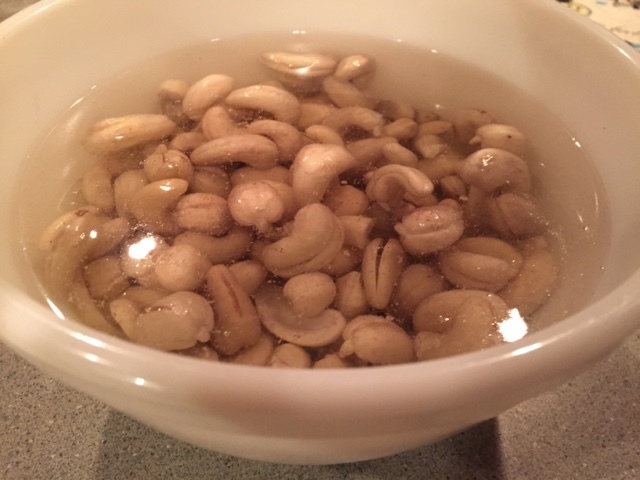 Soak cashews the day before (or boil for 10 min.) and drain. Make mozzarella sauce by mixing cashews, lemon juice, water, salt, onion powder, and garlic. Pulse until smooth. 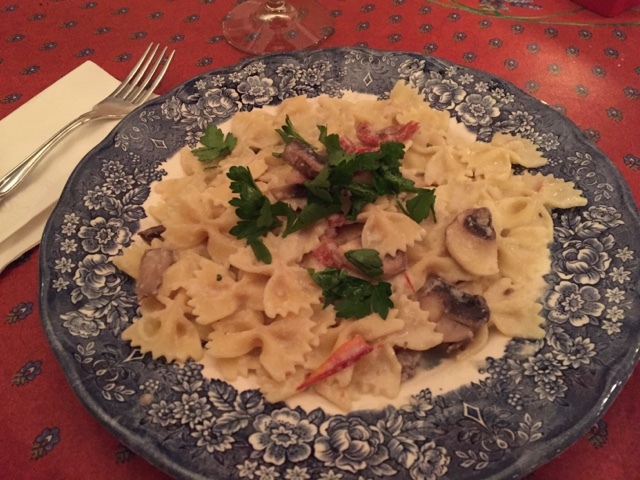 It is outrageously delicious and creamy. 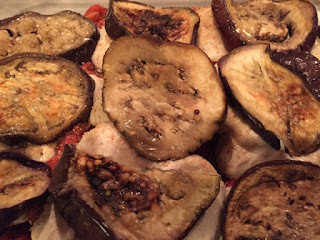 Brush eggplants with oil and broil until browned. 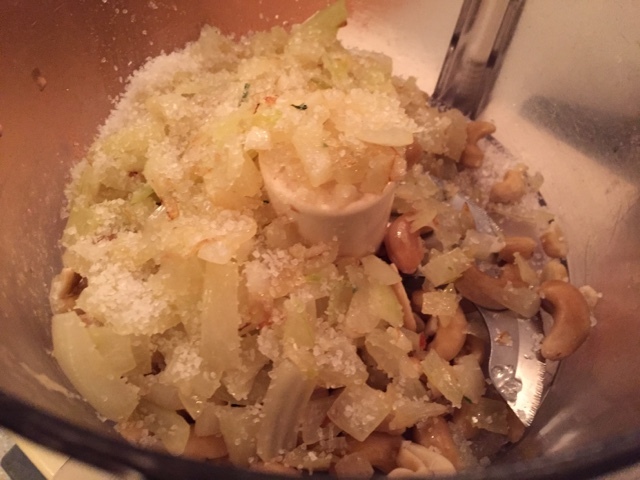 Saute onion, garlic, and olive oil, and add jar of marinara sauce. Preheat oven to 350. In a large lasagna pan, assemble a layer of eggplant, sprinkle with 1 T bread crumbs, half the tomato sauce, half the mozzarella sauce and repeat. 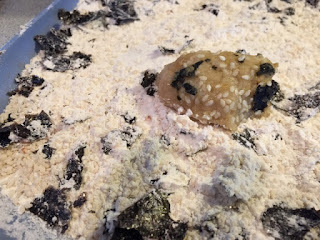 Bake uncovered for 20 - 30 min. Top with fresh basil if you have any. Enjoy! Tip: I cooked the eggplants in advance, so it was very quick to make the sauces and assemble. 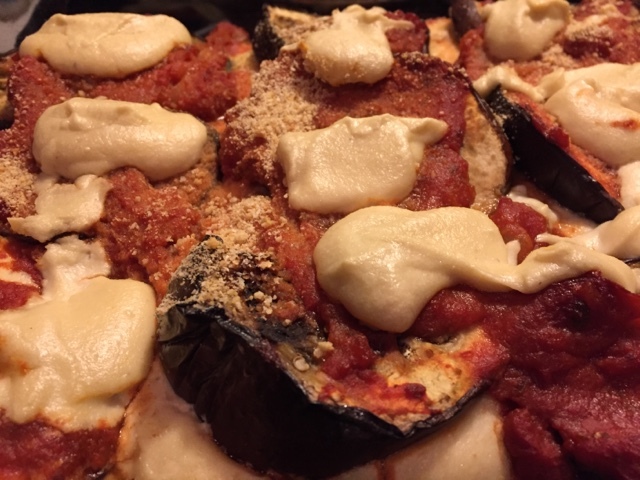 Because my eggplants were cold, I baked it for 30 min. Delicious on a cold winter day! 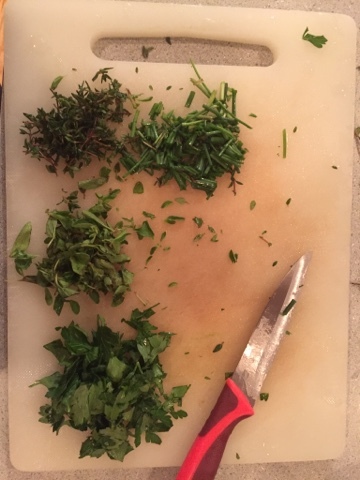 Chop the 4 types of herbs. 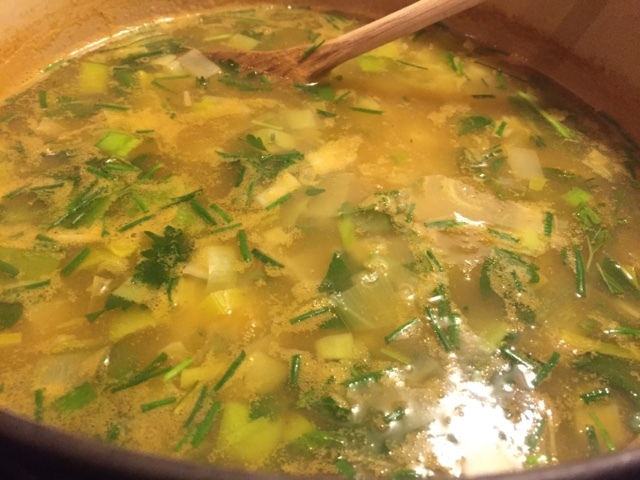 Fresh herbs made this soup extra tasty, but I think dried herbs would be fine as well. 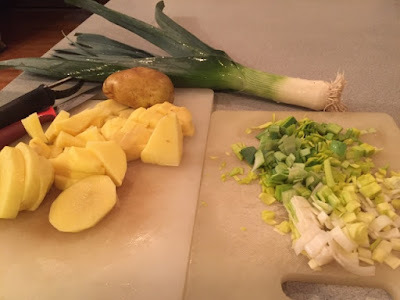 Put stock, potatoes, and leeks in a pot and bring to a boil. Add herbs, salt, and pepper. Simmer, uncovered, for about 30 minutes, until the potatoes are tender. 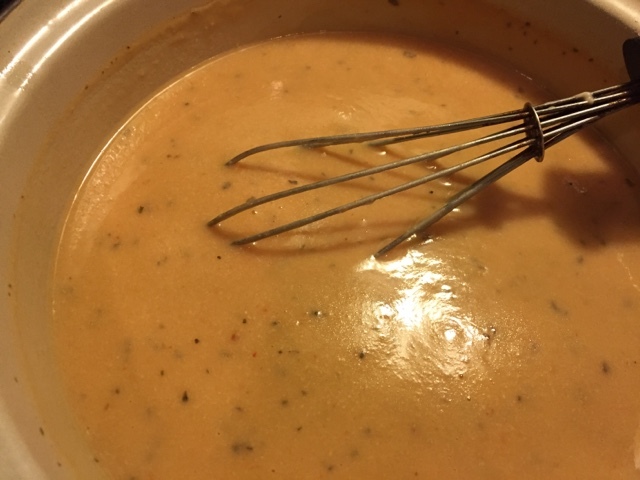 Blend the soup using a hand blender or a regular blender. 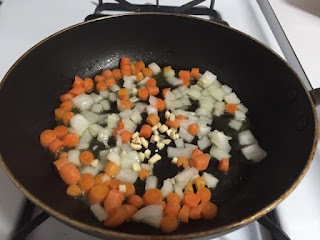 Adjust seasonings as necessary and serve warm. Enjoy! I wasn't sure about sharing this recipe because this was not my favorite. 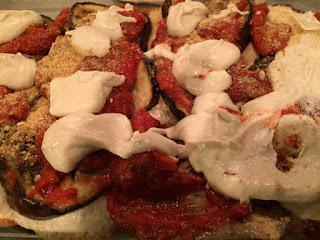 The creaminess of the sauce is perfect, but the almond milk was a little sweet for my taste. It actually reminded me of cocoa - not a bad thing actually. If I try it again I'll add more crushed red pepper. This was fairly quick and a Chloe favorite, so I am including it. Cook pasta, add 1/2 c. sun-dried tomatoes to pot towards the end. Drain and return to pot. 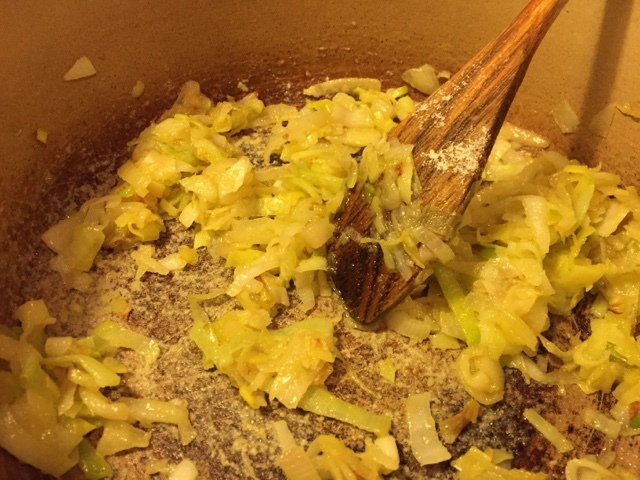 Make a roux with the olive oil and flour over medium heat in a saucepan. 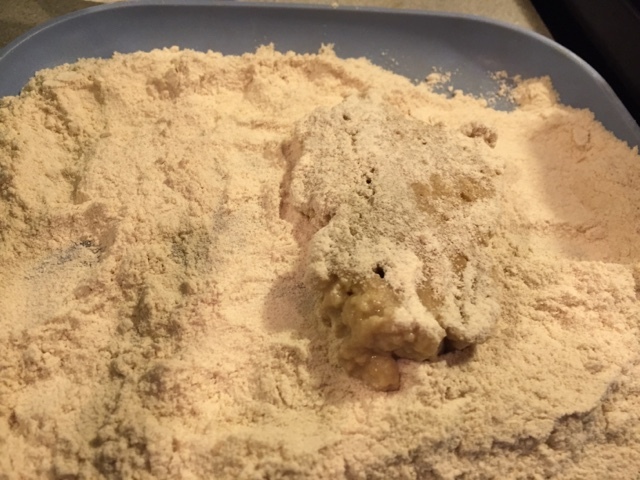 Add almond milk, garlic powder, nutritional yeast, salt, red pepper, and garlic powder. Stir with whisk until thickened. Add remaining sun-dried tomatoes and simmer. Transfer sauce to blender and blend until smooth. Add sauce to pasta and serve immediately. 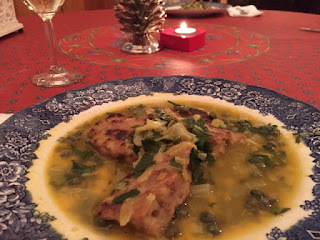 Molly and I had the opportunity to cook a vegan meal together last week. I am writing up the pasta and she will cover the potato leek soup. This was so tasty I will be trying a few more of Chloe's creamy recipes this week! Boil water and cook pasta. Right before draining, add sun-dried tomatoes to pot. Drain and return pasta and tomato mixture to pot. 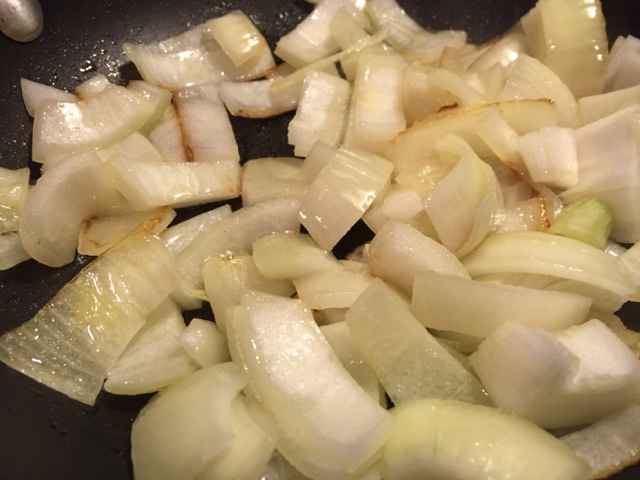 In a sauté pan, cook garlic and onion in olive oil until soft. 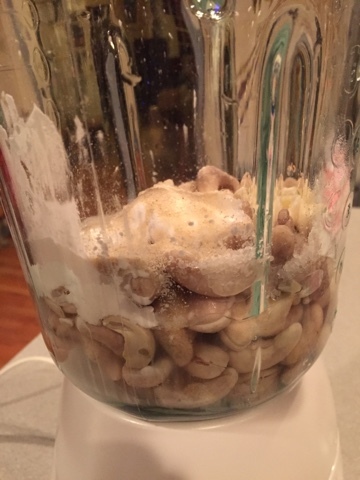 In a blender, combine garlic, onion, water, salt, cashews, lemon juice, and salt. Pulse on high until smooth (about 2 minutes). Make sure it's smooth. 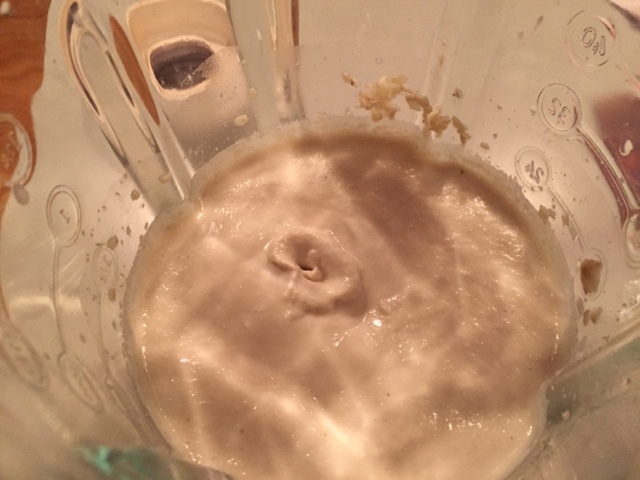 I tried this in the food processor and it leaked, so use a blender. 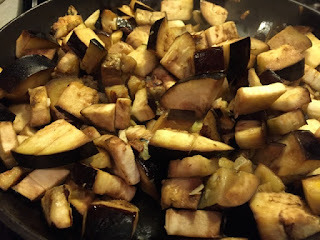 Cook mushrooms in olive oil until soft. Add creamy mixture and heat up. 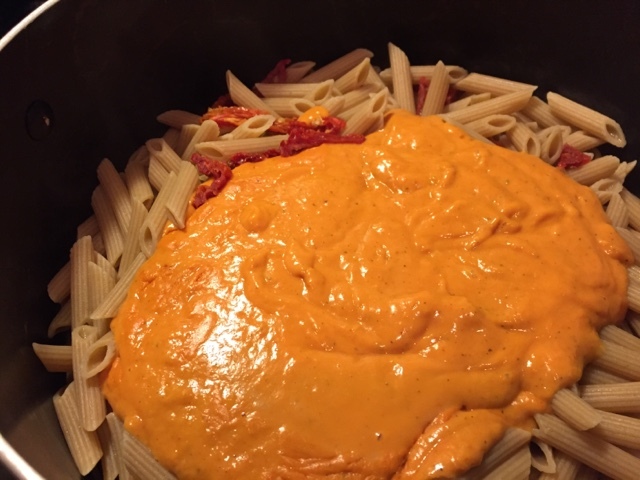 Pour creamy mixture over pasta and serve immediately. Top with fresh parsley and freshly ground pepper. I reheated this at work the next day and it was still great! I almost always have tofu and hoisin sauce in the house, so this was quick to throw together. I think the hoisin sauce and the fresh cilantro make the recipe. 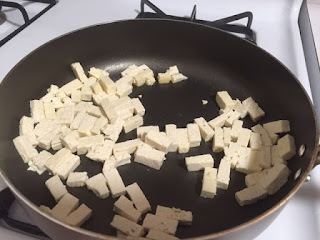 Heat oil, and cook tofu strips until golden. Add hoisin, tamari, and sriracha. Chop cilantro (parsley would also work). 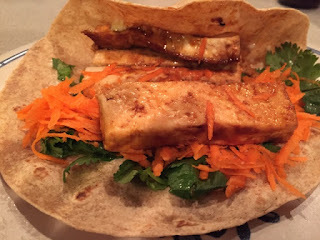 Heat tortilla, spread a thin layer of mayo, add tofu, veggies, and cilantro. I was missing the cuke, but it was still delicious! 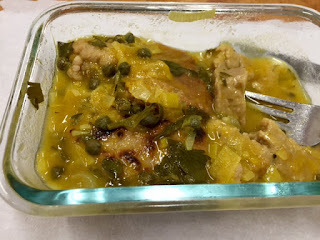 If you love lemony things with capers, this is the recipe for you! 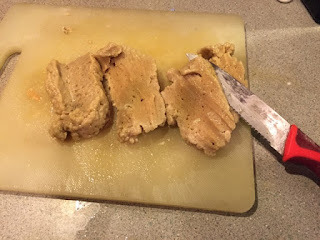 Remove seitan from broth and slice. In fry pan, heat olive oil on high heat and fry cutlets until golden brown on each side. 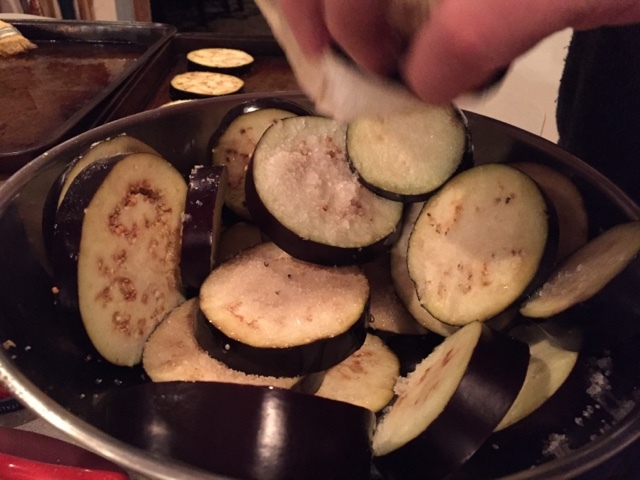 When crispy, remove from pan and set on plates. 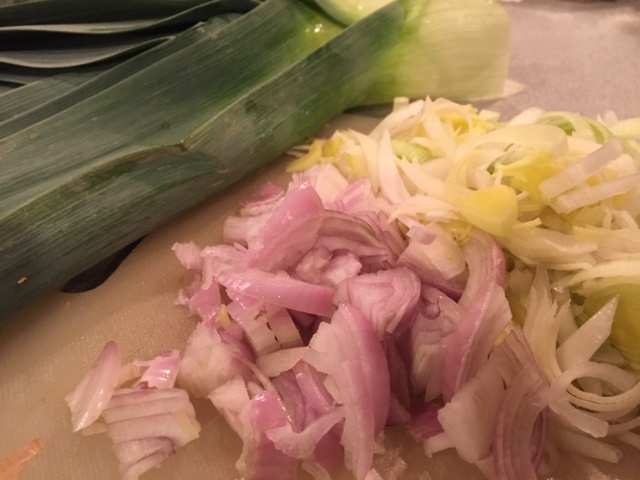 In separate pan, heat up olive oil, add leeks and shallots and cook about 5 minutes.. Make a roux by adding 1 T. white flour and stirring constantly for another 2 minutes. Add 3/4 c. white wine, parsley, broth, and capers. 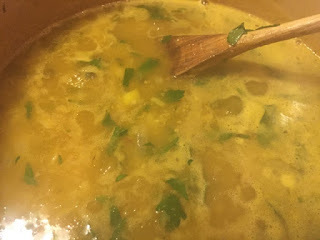 Add bay leaf, turmeric, and lemon. Salt and pepper to taste. Cook for about 10 minutes. Pour over cutlets and serve. Back at school - leftovers for lunch. My students didn't know what to make of it!